Israeli soldiers abducted, on Tuesday at dawn, 24 Palestinians, among them the wife of a political prisoner, from their homes in several parts of the occupied West Bank, including Jerusalem, the Palestinian Prisoners Society (PPS) has reported. 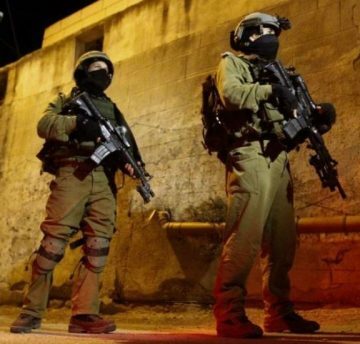 The soldiers conducted extensive and violent searches of dozens of homes across the West Bank, and interrogated many Palestinians, before abducting 24 of them, in addition to installing roadblocks before stopping and searching cars. The PPS office in Jenin, in northern West Bank, said the soldiers abducted a former political prisoner, identified as Nidal al-‘Amer, the son of Ziad al-‘Amer, who was killed by the army sixteen years ago, in addition to Mojahed Abu Khalifa, Nizar Abu al-Haija and Mohammad Sa’adi, from Jenin refugee camp. The soldiers also abducted Mustafa Ezzeddin Zeid, and Ali Abdul-Rahman Ba’jawi, from Ya’bad town, in addition to Nasr Abdul-Karim Alawna, from Jaba’ town, Hammam Ziad Gharbiyya, from Sanour, and Mahmoud Mousa from Mirka. In Ramallah and al-Biereh Governorate, in central West Bank, the soldiers abducted Ayat Sa’id Dahadha, the sister-in-law of Saleh Barghouthi, who was assassinated by undercover Israeli soldiers on October 12th, 2018, in addition to Yasser Hazem ‘Aqel, Ahmad Sami Hammad, 40, Adham Ibrahim Ayesh, 21, and Eyad Dar ‘Aassi. In Bethlehem, south of occupied Jerusalem, the soldiers abducted Mohammad Nassim Sabah and Hadi Athab Salah. The soldiers also abducted Mo’taz Abu Sil, 19, from the al-Arroub refugee camp, north of Hebron, in the southern part of the West Bank. In Qalqilia, in northern West Bank, the soldiers abducted Mohammad Abdul-Elah from Kufur Qaddoum, east the city. It is worth mentioning that the soldiers abducted four Palestinians, including three children, who remained identified at the time of this report, in addition to Ahmad Sadeq Khatib and Salah Shalabi Askar, from Hizma town, east of Jerusalem.